Polka dots are a favorite! They are fun, playful and always on trend. Polka dots have a retro vibe and men wearing polka dot shirts not only look attractive but always remain on the top charts in terms of fashion. Read through these tips to pull off polka dots in style. Scarves: Polka dots shirt look good with a casual, elegant or a classic outfit. All you need to think about is which color you are styling. Ties: You can't afford to go wrong in this, make a vulnerable color pallet. The best and evergreen combination is white and black. Jackets: Dark blue color and white dots is an ultimate way to show off your bolder side. But make sure you keep everything neutral. Get ready for all the limelight! Evening Wear: Going for a night out with friends? Why don't you match a pair of jeans or chinos with your polka shirt. Likewise, weddings are the best time to embrace your polka outfit. Not many will try this, but if you have made up your mind, then no one is stopping you. For another option, match your top with your dotted suit trouser. 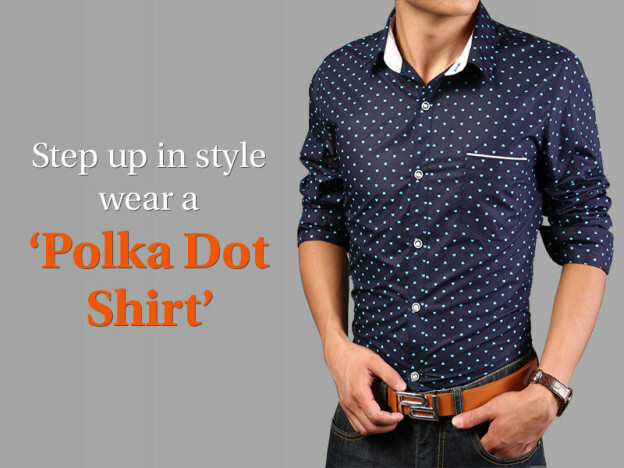 Shirts: If you are a attention seeker lover, then polka dot shirt is made for you. You have to think how big you want ots to be in yor outfit. Final Tip: Always make sure that the dot pattern is diagonal/lineal and small. It will be a disaster when the dots will be splotches.